Good morning! In an effort to come up with something really creative with my Wild Flowers set for you today, I discovered another really fun way you can use those butterfly images in the set: make big, showy leaves for the flowers! Leaf clusters are already included in the set, but these have a different shape and size and the detail inside the wings adds a special touch, and so simple to do. Here I inked up the larger butterfly with a Memento Pear Tart marker and then added a few streaks to the center with Memento Bamboo Leaves marker and stamped. Cut out. Snip each butterfly into four separate leaves, or two V shaped clusters. Slip under your flower and arrange as desired. Doesn't this double blossom look terrific? The flowers are stamped four times with Memento Angel Pink and cut out. Stamp the separate dotted stamp into the centers inked with Memento Tangelo. Curl edges with fingers and mount one on top of the other with pop dots. I added a bit of Crystal Lacquer to the centers and sprinkled on bit of Doodlebug orange glitter before it dried. Finally, Splendid Circles are definitely one of my favorites of the new Spellbinders die sets, can you believe all that pizzazz and detail you get from just one die cut?? I layered a Black Onyx Classic Circle behind it to make the details inside pop more. Pure Luxury White base is embossed with Cuttlebug Leafy Branch folder. PS See that linen-looking mat under my work? It's from Scor-pal and I love this Stay Put Craft Mat! Will come back with a post all about it, but it is so terrific for my work surface as well as staging photos for my blog, LOVE!! Good morning! New cardstock in da house! Just wanted to show you a photos of the new Gina K Pure Luxury Jelly Bean Green Pure Luxury cardstock next to all the other greens in the Gina K Designs line for comparison. It's not like any other green I had, pure Luxury or otherwise, and you know I love using my many greens! Much deeper than the pastel Creme de Menthe, not as bright as Key Lime. I am VERY excited to use it with all my flowers: it is the perfect, leafy Spring green, in my humble opinion! Hope this is helpful to you in ordering and choosing your cardstock! :) Of course I'll continue to use them all, so nice to have this wide variety for the different seasons and pairing with other colors! Hope your week is off to a great start, I'm headed for the gym! Hugs! Hope you've had a great week so far! Here is the finished Wild Flowers card I mentioned on Monday, please see this post for step by step photos of the fastest way to re-create it. After the last photo, I inked up the stem a few more times and stamped off to create blades of grass and add a little more depth. just a few dots of black gel pen to the center or each ad a nice contrast and tie in the black amt and sentiment. A line of piercing along the bottom (using Scor-Bug and Scor-Pal) is an understated detail that works well with the flowers centers. Cardstock is Pure Luxury Wild Dandelion, Black Onyx and White. Tip: When using the same flower image repeatedly on a design, turn it at a different angle each time you stamp to keep them from looking like the same blossom and add more interest. Love having "hello" greetings, these make perfect "any occasion" cards to have in your stash and then add birthday, encoruagement or thank you messages to the inside in a pinch! Gina K Designs: March "Spring has Sprung" Hop! The Design Team for Gina K. Designs welcomes you to a fun Spring Has Sprung blog hop. 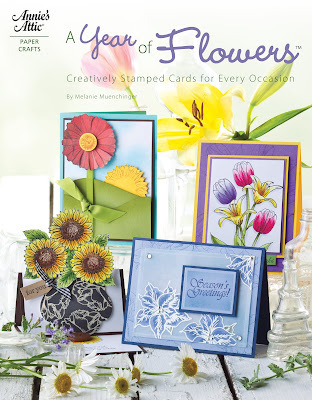 For this hop we will showcase Spring cards and projects with you! 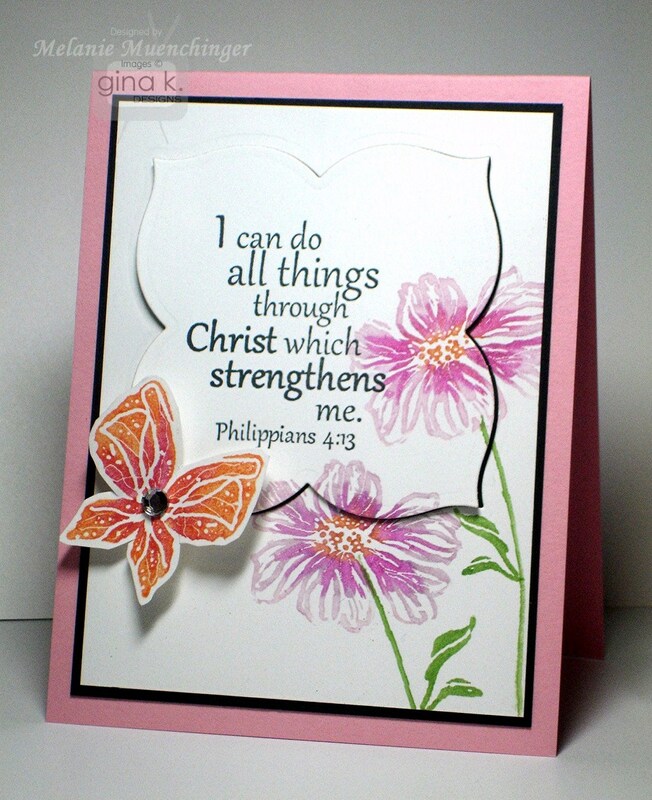 The DT Members have all used a wide variety of Gina K. Designs stamp sets to inspire YOU to get inky, too! Come play along with the Current Challenges at Stamp TV! If you came from Lori McAree 's blog, then you're right where you should be. If not, please go to Stamp TV where you will find a list of all those participating. Today I have another Clean And Simple card using Wild Flowers, this time with just a butterfly! (There I go using Blue Raspberry again, twice in one week, but I'm pretty sure I've never put it with Innocent Pink!) March is a really busy month for us (hence all the CAS designs! ), but also I just love doing quick and easy direct to stamp techniques with bold images! When inking the butterfly begin with yellow Memento Marker (Cantaloupe) at center and work your way out to color each side of the visible spectrum: orange (Tangelo) and then red (Rhubarb Stalk) above, and beneath, green (Cottage Ivy), blue (Bahama Blue) then purple (Grape Jelly). This light to dark coloring process will allow colors to blend evenly and keep you from dirtying up your light markers. Also, I wanted to show how you can use those little dotty stamps in the set to make a whimsical little trial behind the butterflies! See how they are in a fatter cluster ant one end and go to a point with just one dot? Ink up and stamp one way, then turn the stamp upside down and overlap with the first cluster so they are pointy on the ends and thick in the middle. Repeat until you have the desired trial length, see how that looks so floaty and ethereal? Finally, because I really wanted the focus of the card to be the colors, I inked up the greeting the same way to emphasize the different words (red for "love" of course, and "laugh" in a rainbow to make it more whimsical!) and stayed away from adding patterned papers. The curved punched corner in Red Hot gives it some pop. Add just a few adhesive rhinestones for sparkle. That's it! happy card! Now hop on over to Tina Gilliland's blog for more Gina K. goodness!!! Thank you for visiting today! 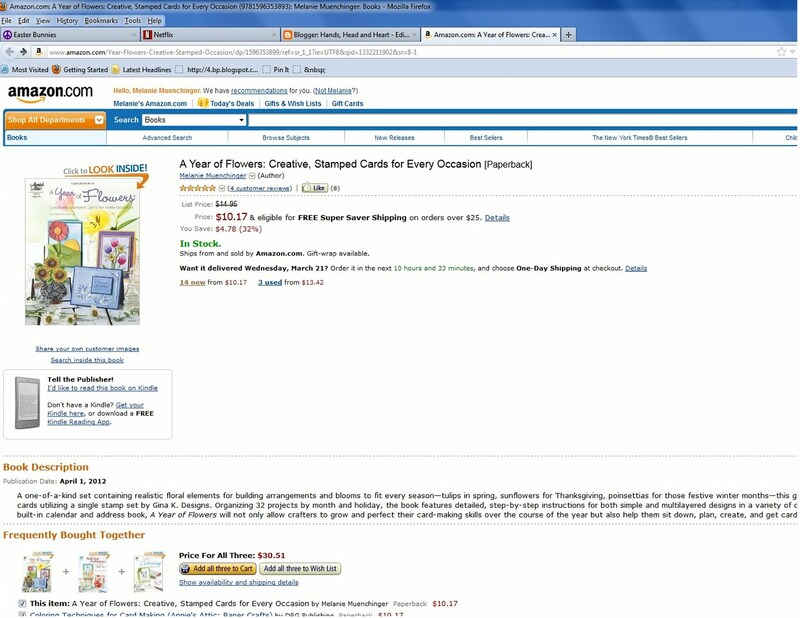 My Book is now on Amazon! Good morning! 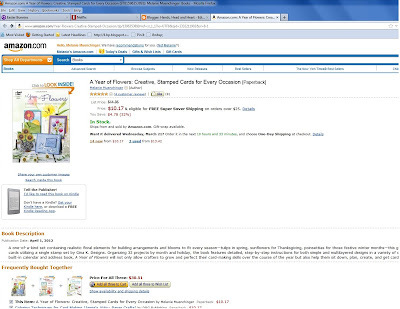 Just had to come share the news, my book "A Year of Flowers" is now available for purchase on Amazon.com, woo hoo! :) ( I knew it was coming soon, but has been listed as "April 1" so I didn't know it would be this soon!) After a couple months of pre-order, you can now order the book, which also qualifies for free super shipper savings with an order of $25 or more. I know a lot of people have said recently the stores near them are currently sold out (as is Gina, although she said be adding more to stock any time now!) so here is another option! Reviews take time and effort ( and please do not feel any obligation or pressure to do so), I know, so if you would prefer, there is also the option at the top of that page to "like" it, if you like it! :) I am just grateful for your help in any way and again appreciate ALL your support of the book! "Support" comes in so many forms, from purchasing it, to telling friends, to sharing news on Facebook, to writing me with your questions and comments, and of course making the cards and using the stamps! I just love ya!! Gotta scoot, blog hop tomorrow! See you in the morning, have a great day! Oh PS! Another thing you could do, whether you have the book or not, but have the A Year of Flowers stamp set (and I know most of you do!) is to "like" the set on the Annie's Attic page! Thanks! Good morning! Here is another simple sample and easy layout I made with my new Wild Flowers set when it first arrived, just playing with Memento Markers (Cantaloupe, Potter Clay, Bahama Blue, Danube Blue, Bamboo Leaves, Cottage Ivy). It is so fun doing "Direct to Stamp" with new rubber and finding all the the gorgeous color combos you can create! :) TIP: Always ink up your images with lighter colored inks first and then go over with darker ones to avoid staining lighter pads and makers. Flowers are traced with Sakura glitter pens and cardstock is Pure Luxury Blue Raspberry, Black Onyx and White.A tiny bit of dimension was added to the butterfly and flower centers with a Black glaze pen. 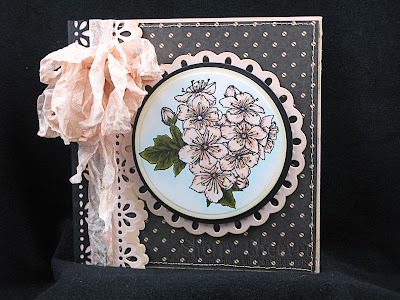 If you came from the CardMaker blog, thanks so much for visiting! :) I'd love for you to stop back for more step by step technique tutorials with Wild Flowers and Wild at Heart this month and become a subscriber! Thanks, CardMaker, for the guest spots these past few weeks! Good morning! Thanks so much for all your kind words this week visiting our hops! :) Going back to Stately Flowers 3 today with my guest Cynthia Olheiser! To remind you, Cynthia lives in Alaska and was a great person to showcase her state flower. Today she works her magic with the two other state flowers in the set, here is one using the bitterroot. I love that she chose to do a crayon resist technique with these flowers, (loving those pops of white at the ends of the petals!) and then sponged he purple and green in big round sections to give it this great look! The repeating circles in the DP are a lovely complement and the glitter gives it such sizzle! Gorgeous card, Cynthia! Describe your style/what you think you do best: Clean and simple is probably the style that I would use to describe myself. Most of my card creations are sent to family, friends and church members by mail. I like to keep the layers and embellishments minimal for mailing. FAVORITE TECHNIQUE: This is really tough because I like to experiment with lots of techniques. However, I really enjoy adding machine stitching to my projects. It’s an inexpensive technique and gives the project a finished look. COLORS/COLOR COMBO: I tend to gravitate toward “Autumn” colors – browns, oranges, reds, yellows. I am least comfortable using pastel colors. FAVORITE GINA K SETS (FROM ANY ILLUSTRATOR) The very first set that I bought from Gina was “Just be-claws”. The crab/lobster in the bucket still makes me smile! I’VE BEEN STAMPING FOR (HOW LONG): I started stamping in the late 90’s when my neighbor invited me to a Stampin’ Up! party. I GET MY INSPIRATION FROM: StampTV, Splitcoast Stampers, Paper Craft Magazine and various blogs that I visit. Tell us about your FIRST stamping experience!! I don’t really remember my very first experience. I come from a crafty family and remember making the ink thumb print animals when I was young. THE MOST IMPORTANT THINGS I’VE LEARNED ABOUT STAMPING/CARDMAKING ARE: Don’t be overly critical of my creations. Create what I enjoy since that’s really what the craft if about. SOME OF MY STAMPING/CRAFTING GOALS ARE: I have taken a long break from scrap booking and would like to get caught up again this year. A longer term goal is to be published by one of the card making magazines. ADVICE FOR BEGINNERS: Join various stamping challenges to learn and stretch your creativity. You may be surprised at what you can create when you participate. FAVORITE THING TO MAKE THAT AREN’T CARDS: Scrapbook pages from our vacations, my nieces and our two dogs (who each have their own scrapbook!). I also enjoy altering frames that I pick up from garage sales. CHALLENGES I LIKE TO PARTICIPATE IN: My favorite challenge to participate in would be sketches. A sketch really gives me the start to create a card. Another craft I have a talent for (or one I would like to try): I enjoy scrapbooking, knitting, and cross stitch. Some day I would love to start quilting, but my budget will only allow for one craft at a time! Tell us about life in Alaska! This is my 19th winter in Alaska. My husband and I moved to Anchorage in the Fall of 1993 and have never looked back! The state is beautiful and we both enjoy the outdoor activities that the state offers – camping, hiking, skiing, 4-wheeling, fishing and hunting. The summer months are generally from June through early September. September is generally raining and lasts until mid-October when the first snowfall can arrive. During the summer months we experience 20 hours of daylight with only twilight during the four hours of dark around summer solstice. Winter months are the opposite with 4-6 hours of daylight at winter solstice. We lose/gain a few minutes each day so it’s gradual, but noticeable at solstice. Of course, Alaska is known for its moose, bear and salmon. We have all three within the city limits of Anchorage! Many moose have taken a liking to my daffodil buds in the Spring…. Munching them as though it were a free smorgasbord. Luckily, we have a 6 foot privacy fence in the back yard to prohibit the moose from reaching our vegetable garden! I have a dual bachelor’s degree in Business Administration and Home Economics with an emphasis in Clothing and Textiles. I took my first sewing class in 7th grade and learned how to use a sewing machine by stitching on paper. It seems as though I have come full circle from my days in that Home Economics introduction class! I still have my Brother sewing machine that I bought in college and it is what I use when adding stitching to cards. WHAT I DO WHEN I’M NOT STAMPING: In the summer months I spend as much time as possible outdoors. My husband and I have several flower gardens and a vegetable garden. We also spend our summers camping, fishing and riding 4-wheelers on mountain trails with our two Labrador retrievers. During the Winter months I cross-country ski, read and spend time in my craft room. Be sure to visit Cynthia's blog today to leave her some love and see what she did with the magnolia! Thanks for visiting, and have a terrific weekend! God bless, see you tomorrow! Good morning! The Design Team for Gina K. Designs welcomes you to another fabulous Inspiration Blog Hop! Get ready to be inspired with many beautiful ideas for our newest stamp sets and papers. As you hop through the blogs, make sure to leave a comment on each of them because we will choose a few random comments and those stampers will each win a grab bag of deeply etched, pre-cut Gina K. Designs stamps! To see the full list of winners, check the Big News forum at Stamp TV a couple of days after the hops. I loved this Parisian Garden print so I stamped the butterfly on it several times at angles to create a border, then filled in small sections of the wings with Copic RV89 for extra pop. The I stamped the butterfly on White Pure Luxury and used the shades form the DP to color. Trace these areas with a little coordinating glitter pen for extra sparkle. Greeting is stamped on Lovely Lavender and base is Black Onyx. (Yes, I totally want to redo the "BE YOU" part to be like Gina, lol!) Butterfly is adhered with pop dots. Next we have the Free with Three set "Great Sayings", I just love big quotes for cards! This set contains three large greetings and a versatile happy flower, great for making clean and simple designs. Here is my sample (unfortunately on the sample I made last week, I used the only sentiment in the set that had a little typo, oops! haven't redone the card yet, but rest assured per Gina's post everyone who earns the free set will have the correct quote, see the full set above for corrected quote! :) I used the damask patterns from the Petals and Wings I used the previous two days, and I just love how this pack contains both whimsical, cutesy prints and but also delicate and elegant ones like on this card! Card also uses Pure Luxury Black Onyx and White, and is accented with rounded corner punch and Pure Luxury button. Melanie Muenchinger you are here, thanks for visiting! The Design Team for Gina K. Designs welcomes you to another fabulous Inspiration Blog Hop! 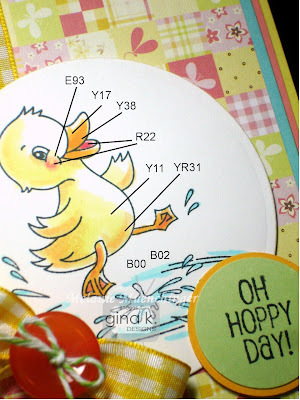 Gina and the Design Team will inspire you with many beautiful ideas, and as you hop through their blogs, make sure to leave a comment on each of them because we will choose a few random comments and those stampers will each win a grab bag of deeply etched, pre-cut Gina K. Designs stamps! To see the full list of winners check the Big News forum at Stamp TV a couple of days after the hops. 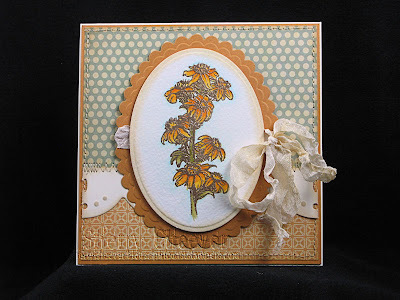 Today we are featuring samples using the newest StampTV Kit Petals and Wings, what a terrific kit! See that link for a complete description of the all the fun contents. Piercing detail is made with with the Scor-Buddy and Scor-Bug embossing tool. Ribbon is Stitched Black Pure Luxury. I stamped the balloon four times: once on the Ocean Mist background to create the sky, once on White CS for the clouds, and twice on the different patterns to piece over the original image. Use pop dots to adhere for more dimension. Melanie Muenchinger- you are here, thanks for visiting! Have fun hopping, see you back here tomorrow for our final day of hops! The Design Team for Gina K. Designs welcomes you to another fabulous Inspiration Blog Hop! As you hop through their blogs today, make sure to leave a comment on each of them because we will choose a few random comments and those stampers will each win a grab bag of deeply etched, pre-cut Gina K. Designs stamps! To see the full list of winners check the Big News forum at Stamp TV a couple of days after the hops! First up, we have the gorgeous safari set "Wild About You" from Theresa Momber. Loving all these animals and silhouettes that so perfectly capture the heart of Africa! Maybe I'll make it there some day, exotic names that roll off the tongue like Kalahari, Congo, and Zanzibar have always captured my imagination, so I'll be making some very inspired sunrises and sunsets with this set in the meantime! TIP: Google "African sunset" to find some gloriously vibrant photos for realistic colors to use and model your cards after! This card is inspired by a layout and technique tutorial from my book "A Year of Flowers". The torn reverse masked edge is so appropriate for the rugged landscape. Sponged sunset and grass use Wild Honey, Mustard Seed, Barn Door and Black Soot Distressing Inks. TIP: Instead of using a mask to create a hard horizon line, instead I started sponging at the bottom and made strokes upward over and over to crate the illusion of long blowing grass. Card base and elephant are Pure Luxury Moonlit Fog, elephant is popped up to look like he is coming out of the scene. So easy to color this elephant! Stamp in Memento Tuxedo Black on gray cardstock, then add shadows under the ears, legs and trunk with W-1 and W-5 Copics. TIP: Using Theresa's lines and dots in the image as a guide make it easy to create some wrinkles and folds in the ears with quick strokes of your marker or pencil, starting on the edge and working inward toward the head. Add a bit of white to the trunk and eyes with an Inkssentials Gel Pen. Cut out elephant and snip around the ear and pull out slightly to add more dimension before adhering on pop dots. TIP: stamp elephant's feet planted on grass onto white mat, then put cut elephant over it, this way you aren't cutting out the individual blades of grass. To accompany this card, please bust out your best rendition of one of the most memorable choruses of the 80's, Toto's "Africa"! Altogether now! Next up, We have Rupa Shevde's Blooming with Blessings, a sweet spring set of animals and sayings! I chose this adorable duck and found a perfect match for the Copic colors and cardstocks I decided on in this Pure Luxury Petals and Wings print. Here is a closeup of the coloring. Card uses Pure Luxury White, Ocean Mist and Just Peachy for the mats, Lemon Drop for the base, and Wild Dandelion and Creme de Menthe for the tag. Have a terrific day! More inspiration coming tomorrow, see you soon! In case you haven't had much time to surf your favorite blogs this week, I want to make sure you don't miss the amazing designs of the amazing Sherry Cheever using "Stately Flowers 2"! Living in Kentucky, I am so glad she has the state goldenrod in her talented little hands! :) Delighted to see her own spin on these flowers, Sherry always does "shabby" so well! Blue and orange are complementary colors, so these dirtied up vintage versions of pumpkin and aqua work so well! It looks like the flowers are embossed in gold and then colored (but you'll have to check with Sherry to be sure! ), such a fabulous look! 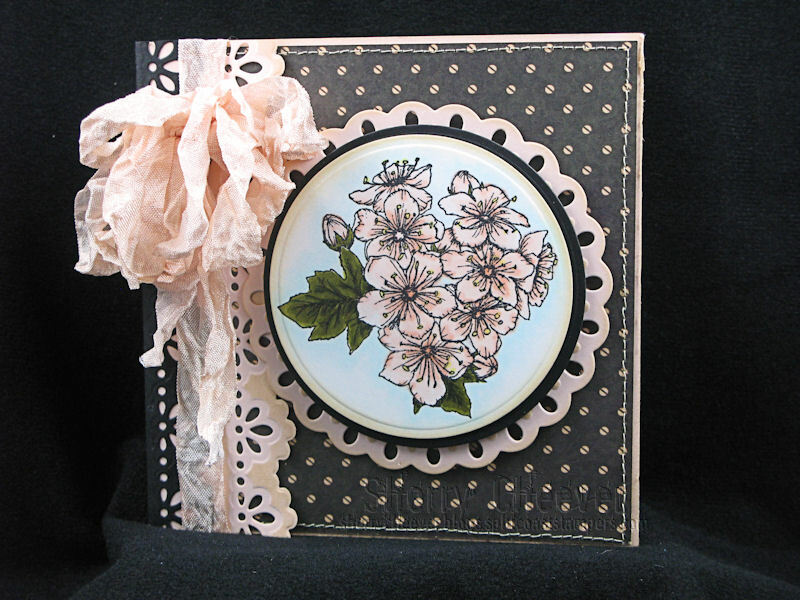 And I am so partial to the girliness of this hawthorn card, don't these flowers look fabulous in pink? Love the double matting of the dies behind the image with the Spellbinders Classic Circle in black and Tear Drop Circle in pink. Something else I love about seeing others use my stamps, often hen I draw something one way, I don't always think to turn it in a different direction when I stamp (it has a "this end up" for me lol!) so when I looked at her card and saw these flowers tilted to the right it just takes on a whole fresh new look! :) Wonderful dotted paper, too, think it is a terrific choice with the tiny flower centers. Hope you will stop by Sherry's blog and leave her some love! Thanks again, Sherry for working your magic with my stamps! Have a great weekend! We are having really nasty, cold, wet weather here, so there will lots of movie watching and snuggling and hot things to eat and drink (all a few of my favorite things!) Looking forward to it! The Design Team for Gina K. Designs welcomes you to another fabulous Inspiration Blog Hop!!! Gina and the Design Team will inspire you with many beautiful ideas! And as you hop through their blogs, make sure to leave a comment on each of them because we will choose a few random comments and those stampers will each win a grab bag of deeply etched, pre-cut Gina K. Designs stamps! To see the full list of winners check the Big News forum at Stamp TV a couple of days after the hops!! First up today, we have my new "Wild Flowers" set, a bold two step stamping set that coordinates with the popular previously released "Wild at Heart" frame set. I am so excited to have these additions, with new greetings and some matching butterflies. Stylized bold flowers are so great for a multitude of stamping techniques and making quick cards with beautiful bursts of color! Perfect for the rock and roll technique Gina shared recently on StampTV using your ink pads, today I'm getting out my water-based Memento markers for some direct to stamp coloring! TIP: Scribble on your lightest color first, and then add your darker colors so as not to dirty up the tip of a light colored marker. Once you have all the colors where you want them and image fully inked, huff on it to moisten the ink and stamp. You will love building simple or fuller arrangements with all the different leaves and buds! Several people commented yesterday they liked how I "double-stamped" the flowers on the panels, but actually, I just stamped these on a flat panel of white CS, then die cut with my Spellbinders Labels 24 to give the greeting more impact and add more interest to the layout! TIP: I offset it just the tiniest bit so you'd have a little more of the black peeking through, rather than just the added dimension of the pop dots. Card base is Pure Luxury Innocent Pink. Next, I want to show you fast you can build a field of flowers! Here are five different images from the set placed on the long rectangle block , inked up and ready to go, this block is a must have! Next I inked up my flowers one by one with Memento Sweet Plum and Grape Jelly on the petals and Rich Cocoa in the centers. I didn't bother with a stamp positioner, the die cut images make it so easy to eyeball and if they are slightly offset you get a tiny white reveal that gives it a more whimsical look. Finish with the other flowers and stamp a sentiment in the lower corner. Originally, I intended for this to be a single layer card on Pure Luxury (which is why you see that large white border) but after using the purple shades I decided to kick it up by including one of the new Pure Luxury Parisian Garden patterned papers around the border, these patterns all look so terrific with my new flowers! The finished card is just three layers (and only one color cardstock-white! ), but the two step stamping and border around the frame make it look like so much more! Lots of fun tutorials coming up with this set, so please check back! Hope you love the new set as much as I do and enjoy using it with "Wild at Heart"! on a frosty beverage!! Father's Day is not too far off, plus birthdays of a couple men in my life! I stamped the labels onto Gina K's waterproof labels and then cut them out with the Labels 22 and Grand Calibur. Soak the labels off the bottles you'll be using before adhering your custom labels. Full disclosure, I WILL say soaking the labels off a beer bottle was much more difficult than soaking off a wine label, gotta scrub scrub scrub (different glue, I guess) just sayin'! It IS worth doing for one bottle, but for a whole six pack or more, I would probably create a paper wrap/sleeve to go around each covering the original label and then adhere my new one on top, that would look great too and be much easier! Label is colored with Copics. This is an* adult beverage* but would be super cute on soda bottles for a birthday or slumber party! Wouldn't these be so fun on a big wash tub tub full of root beers or colored in PINK for girls night?! (hmm, my birthday is coming up...!) As you can see, these two particular greetings are gender neutral, for the "rock star" in all of us! Hope this project inspires, so many picnic and outdoor events to look forward to with spring and summer on the way! Have a great weekend! Fun stuff coming up this weekend and inspiration hops resume on Monday! See you soon! Release Party Tonight, You're Invited!